← How different is Scotland? 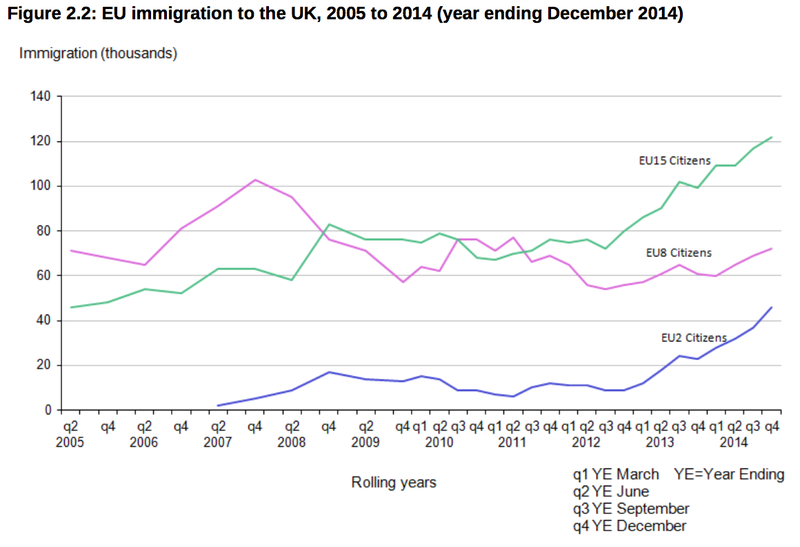 2014 looks set to be a record-breaking year for immigration, according to the ONS estimates published yesterday. 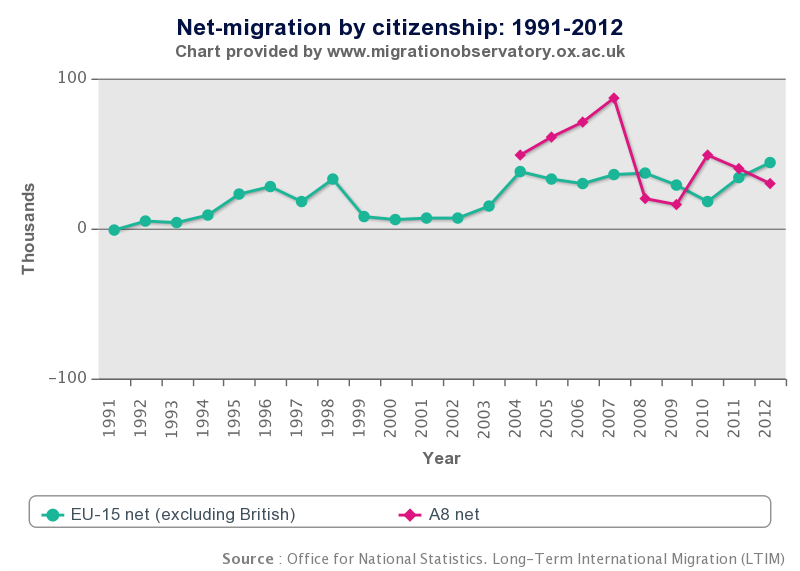 After a brief post recession dip, net immigration from the EU began to rise again in 2010 and last year, non-EU migration increased too. The gross migration figures in the next chart show the different patterns of EU and non-EU migration. Some of the sharp drop in net EU migration was due to people going back to their home countries whereas net non-EU migration fell because fewer people came in the first place. There is a higher churn among EU migrants because it’s not as far for them to go back home and it’s easier to come back again. 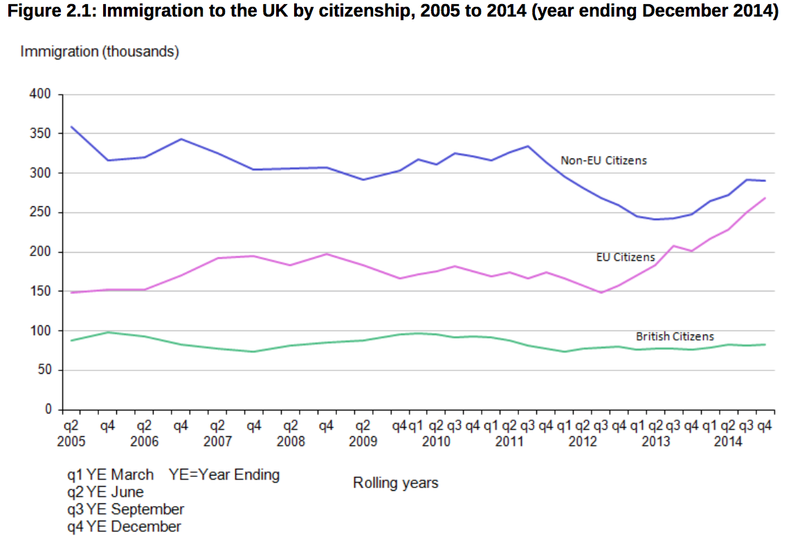 The composition of EU migrants has changed as well. We tend to assume that most come from Eastern Europe but, in recent years, more people have been coming from the old EU15. Some of this is due to the recession and unemployment in southern Europe but immigration from the EU15 has been rising since the mid 2000s. 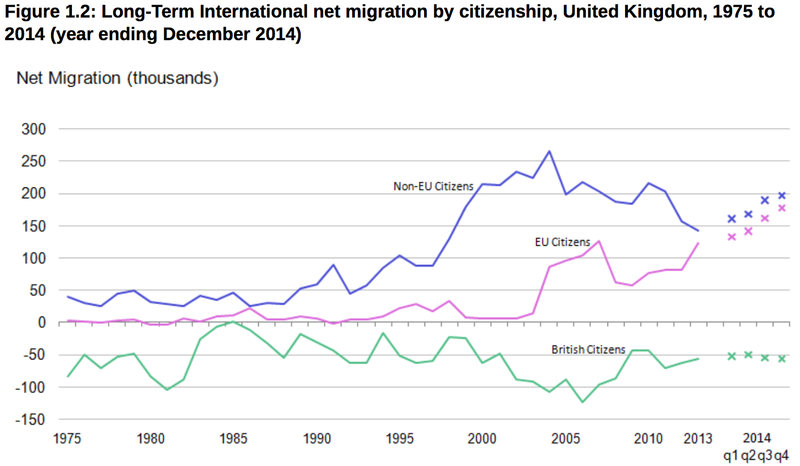 This chart from Migration Observatory tells an interesting story. Immigration from eastern Europe rose sharply after 2004 there was also an increase in net migration from the old EU at around the same time. The story of EU migration, then, isn’t just an eastern European one. The UK is attracting people from all over Europe. This CityLab article explains some of the background. 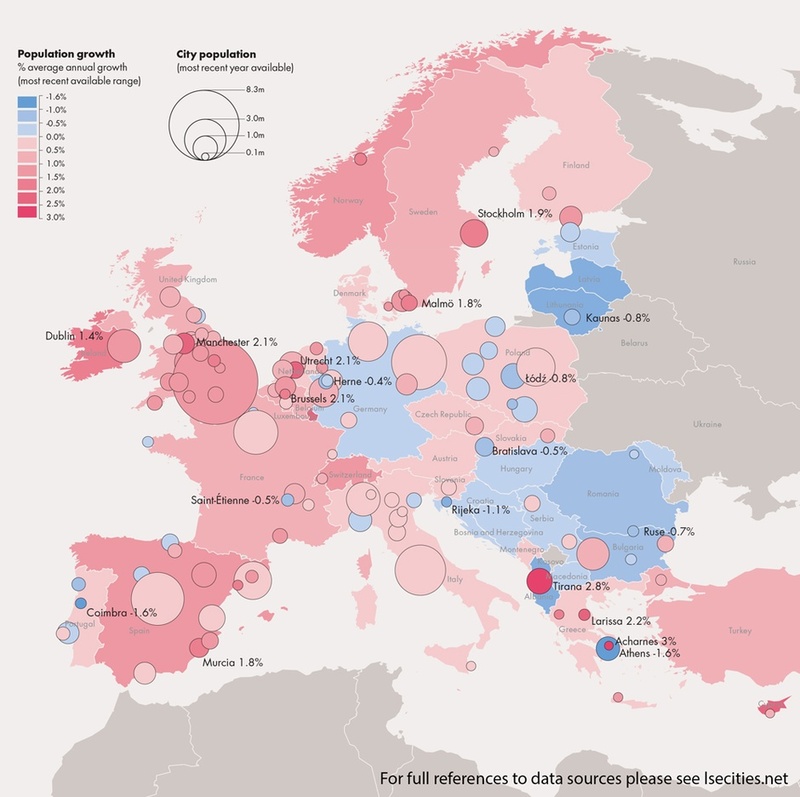 Europe’s population is shifting to its prosperous north-west, with London, the largest city in the EU, having by far the largest migrant population. As Elli Thomas of Centre for Cities points out, based on figures for NI Number registrations, 43 percent of migrants and 48 percent of those with degrees go to London. Having a big fashionable international city that dwarfs anywhere else in the EU and a language that much of the world speaks, makes the UK a favoured destination for workers from across Europe. Young people want to come to London and London seems to have no trouble creating lots of jobs for them to do. I have no data for this but most of the young EU workers I have spoken to say that having worked in London means they can then get better jobs when they return to their home countries. Working here becomes like an extension of university. As one cohort goes home to improved job prospects another group of freshers arrives to take their place. Today’s figures show how difficult it would be to reduce net migration to the ‘tens of thousands’. 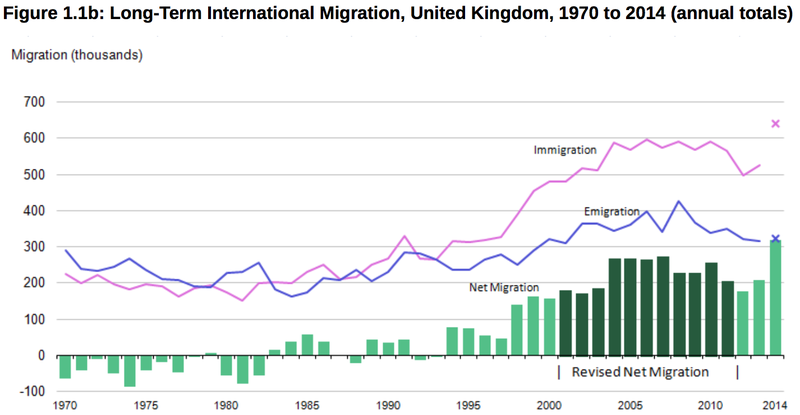 Net migration has risen even despite new restrictions on family, work and student visas that were introduced during the last parliament. If the cap on skilled migration does start to prevent employers from accessing certain non-EU staff shortly, then the first people it will affect will be skilled migrants on relatively low wages – those with salaries just above the minimum threshold of £20,800. One of the largest groups of these is nurses. Today’s data indicate that it is increasingly likely that some employers – including the public sector – may find themselves unable to recruit non-EU staff over the next year. If this happens, we may see some of them turning to EU workers instead. In other words, there may be a balloon effect going on. If you clamp down on immigration in one area, it just increases somewhere else. The migration cap on non-EU workers may just lead to more migration from within the EU. But what if the UK negotiated restrictions on EU migration or left the EU altogether? It’s difficult to say what would happen because no-one has ever done it but it would probably just squeeze the balloon in the opposite direction. A reduction in EU migrants would increase migration from outside the EU. Either that or companies which couldn’t fill their jobs here would simply relocate those jobs to somewhere else in Europe. For at least the next five years, lots of people, especially the young, will want to come to the UK and this country’s employers will continue to find work for them. Any attempt to take the immigration level back to that of two decades ago, during the life of this parliament, would require drastic action. What that would do to our economy and our relationships with other countries is anybody’s guess but it would probably be very damaging. The UK’s economy has changed a lot in the last 20 years. Trying to wind the clock back is unlikely to do us much good. A very thorough post. Unfortunately the official stats are not very reliable as many recorded as EU migrants are in fact non-EU migrants who have received EU passports from other member states.